It all started entertaining hundreds of people as a member of the Capricorn Band. A time when bands were the service to hire for every event. As time went on and DJ’s became a dominant force, I turned my sites on spinning music in a different way. 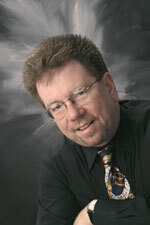 In 1995, I joined ProShow and have had the pleasure of entertaining over 400 clients and growing. When it’s finally time to hang up my DJ shoes and retire...I’m certain the memories of unforgettable parties created would make an excellent book deal! "Thank you for helping us celebrate our wedding. We had a wonderful time. You did a great job of mixing the music to keep both our young and old guests out on the dance floor and reading what people wanted to hear. You included all our favorites at just the right times and go the best train going we’ve ever seen. It was so nice to have you emcee everything. We didn’t have to worry about anything except having fun! We’d recommend you in a second! Thanks again." "Thanks for the great job you did at our wedding reception on June 3 . Everyone rd had a fabulous time, and it ran so well because of you. We couldn’t have been more pleased with the service Tom provided. He was friendly, knowledgeable and ran the show beautifully. We will highly recommend him and ProShow to others. We’ve attended other receptions since ours and we both agreed that our DJ service tops all the rest." "The performance was excellent and I just wanted to say that Tom Termont went way beyond what was expected of him. He made sure the bridal table had something to drink during dinner and made the bride feel that this was truly her night. As the mother of the bride, I just wanted to personally thank him for making our event so special." "We could not have asked for a better DJ. People danced from the moment the music began until the end. Great music selection. The DJ did a great job of assessing the guests and choosing songs everyone enjoyed. We would absolutely recommend ProShow and Tom!"